(Bloomberg) -- It might have seemed like a bold move when the billionaire founder of China Evergrande Group spent $1 billion of his own money buying the company’s bonds five months ago. Now his bets are handing him handsome returns that beat many asset classes. 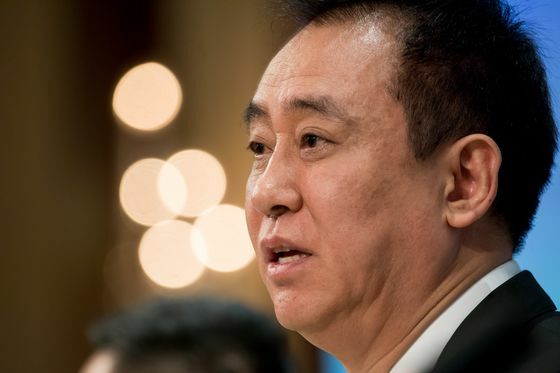 Hui Ka Yan, who is chairman at Evergrande, bought more than half of the company’s $1.8 billion bond offering in October, signifying his "support to and confidence in the Group" when some of its dollar notes had plunged to unprecedented lows due to concern over its debt. The purchase, unusual for an owner of a Chinese property developer, proved to be rather lucrative. The 2022 and 2023 notes have surged to 109.6 and 110.6 cents on the dollar respectively after Hui purchased $500 million of them each at par. Hui’s gained 17 percent and 18 percent respectively on the two tranches, according to Bloomberg-compiled data. By comparison, high-yield dollar bonds from the country’s real estate sector have returned 13 percent over the same period, according to an ICE BofAML index. The dividend yield on Evergrande shares was less than 5 percent in the past 12 months. Hui said he hasn’t sold any of the $1 billion bonds he bought in October when asked by Bloomberg News in an earnings presser in Hong Kong on Tuesday. 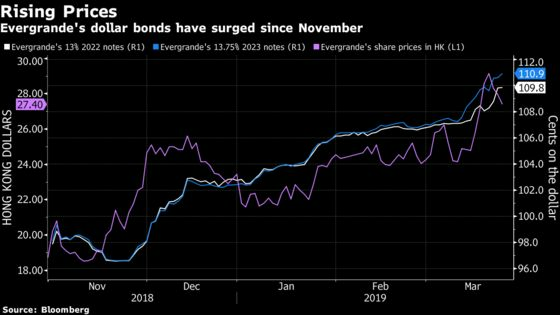 Evergrande’s dollar bonds, along with its peers’, benefited from a return of investor confidence at the beginning of this year on their cheap valuations and the stimulus measures from Chinese authorities. Cities in the country have introduced various easing measures including relaxing price curbs since late last year to boost property markets. Some analysts see more room for China builder dollar bonds to rally further as investors are still bullish on them. "There could still be some tightening in the yield to maturity for Chinese developers in general, including Evergrande," said Yin Chin Cheong, an analyst at CreditSights. Shares of China’s second largest developer by sales have also risen 11.5 percent, underpinned by expectations of its earnings growth. Evergrande, which is the most indebted developer in the country, announced a 93 percent jump in core profit for 2018, beating estimates. Yet it has a $17 billion funding challenge this year. Hui, the third-richest person in China, has collected $3.6 billion pretax dividends since Evergrande’s listing, according to the Bloomberg Billionaires Index. Hui’s net worth increased by 10.9 percent since the beginning of this year to $35.7 billion as of March 27. For credit research houses like Lucror Analytics, it would have been more beneficial to bondholders if the company didn’t pay such a fat dividend and use the cash to cut its debt instead. “It would have been preferable if the company had not paid dividends and reduced the size of the bond issuance,” said Charles Macgregor, head of Asia at Lucror in Singapore.